Zena is using Smore newsletters to spread the word online. 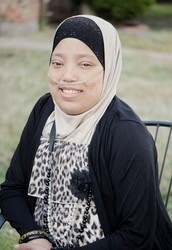 Sanabel Abubaker was a student at Brighter Horizons Academy and continued to be a part of the BHA family after she left. This summer she lost her fight with Cystic Fibrosis. We, the BHA Student Council, are dedicating our first walk to support the Cystic Fibrosis Foundation to help find a cure. Please join us Saturday, Jan 18th at the BHA track. There will be food, drinks, and merchandise that you can buy. All profits go to CCF. The main activity in this walk is walking. However, there will be mini activities arranged for children 5 to 9 years old. There will be no picnicking on the track as that defeats the purpose of the walk.